As name suggest, Uniform random timer is one of the Jmeter timer which is used to generate fixed+random amount of time delay between 2 requests in your software load test plan. Uniform random timer is used when you wants to put some fixed but also some random time delay between 2 requests in your software load test plan. Example : I wants to put minimum delay time 3 seconds and maximum delay time to 10 seconds then i can use uniform random timer in my test plan. Also you can use uniform random timer as only constant delay timer or as a random timer as it is combination of constant delay + random delay timer. You can add uniform random timer on request level to apply timer delay on specific request and parallel to requests to apply timer delay on all requests for your software load test plan. We will see both the ways with examples but first of all you must know how to add uniform random timer in your test plan. Let's add it under controller. 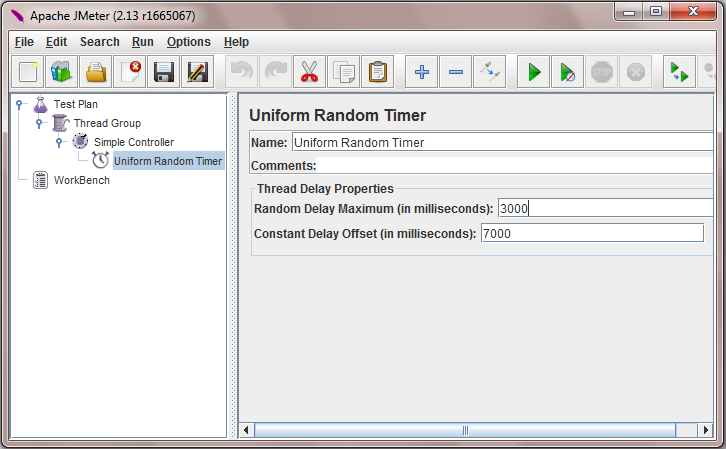 Select Add -> Timer -> Uniform Random Timer as shown in bellow image. 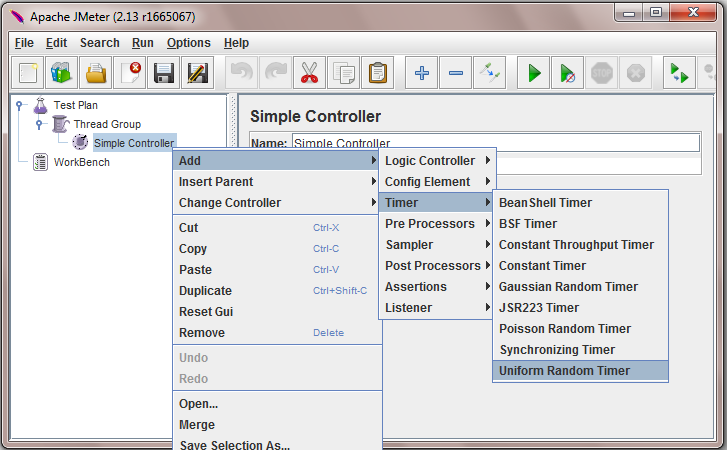 It will add uniform random timer under Simple Controller in your software load test plan. 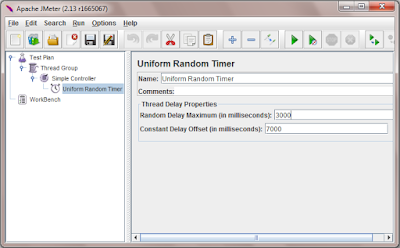 Uniform Random Timer have 2 parameters as shown in bellow image. Random Delay Maximum : This is outer boundary limit of random time delay. It will decide maximum random pause time. Constant Delay Offset : This is the fixed delay time which will be added in random delay. In above image you can see, I have set Random Delay Maximum = 3000 milliseconds and Constant Delay Offset = 7000 milliseconds. That means it will put random delay between 7 seconds to 10 seconds between two requests. Bellow given links will show you usage of uniform random timer in different ways. Uniform Random timer parallel to requests with example. Uniform Random timer under request with example. Uniform Random timer with random and constant delay only with example.